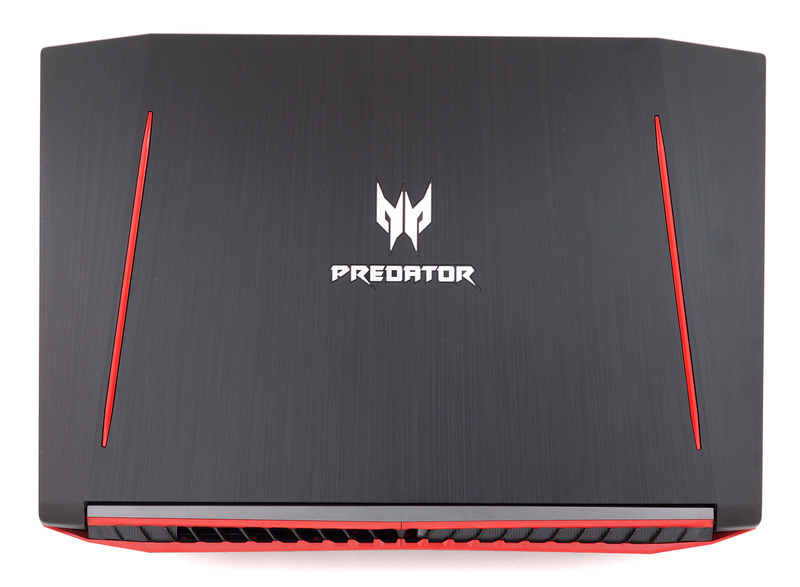 Ever since Acer launched its affordable 15-inch GTX 1060 gaming solution, the Predator Helios 300, users around the world were immediately attracted by its excellent price/performance ratio. We also had the chance to play around with and our early verdict on the notebook is that it has some considerable drawbacks, which, by the way, aren’t driven by the price tag. 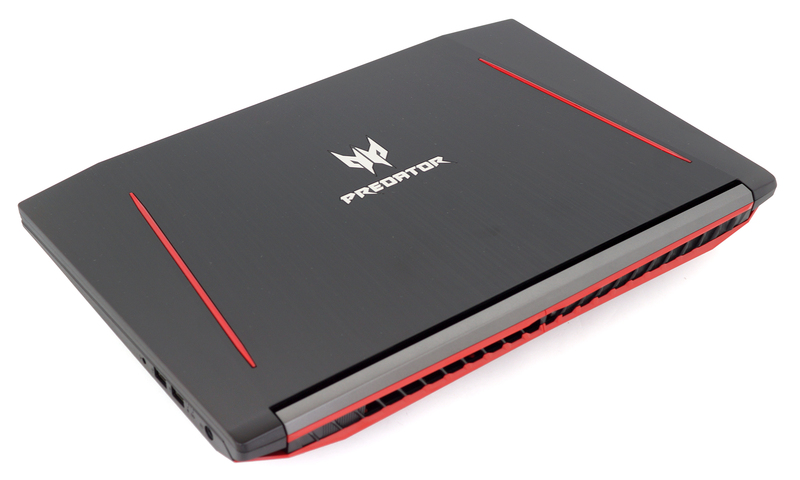 Acer is also planning to launch a 17-inch version of the notebook that should come as a more affordable alternative to the Predator 17 (G5-793) with GTX 1060. Interestingly, the 17-inch Helios 300 has fewer similarities with the 15-inch model than expected, aside from the design and hardware, of course. 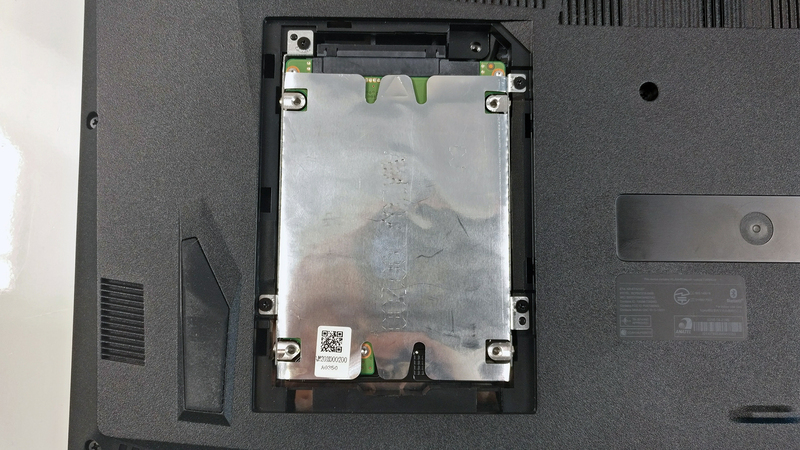 This is probably the reason why the 17-inch Helios 300 has vastly different model number – PH317-51. Anyway, both have the same Core i7-7700HQ / i7-8750H paired with NVIDIA’s GeForce GTX 1060 GPU, up to 32GB of DDR4-2400 memory, Full HD IPS displays and standard storage configuration with M.2 PCIe NVMe SSD and a 2.5-inch HDD. But when it comes to build quality, things are done differently here. 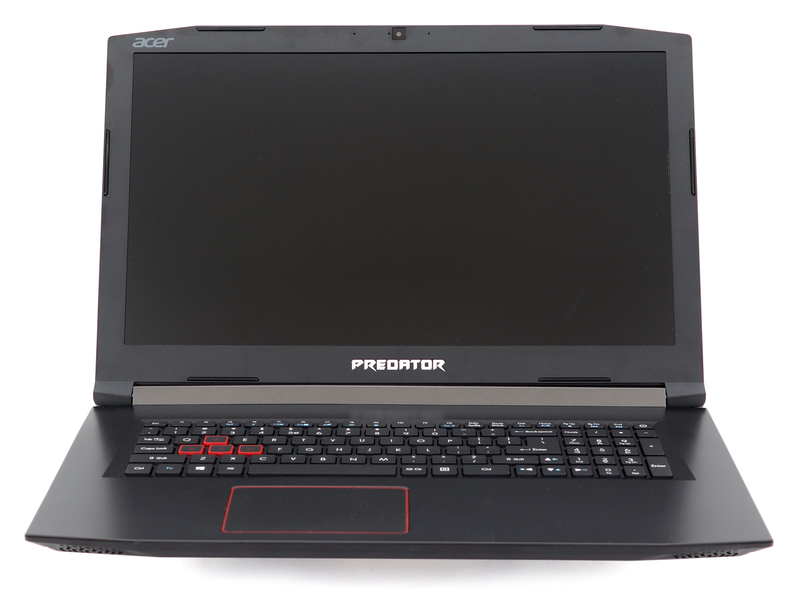 The 15-inch model boasts an aluminum lid and metal interior but the 17-inch model is entirely made out of plastic and strongly resembles the Aspire VX 15 series. 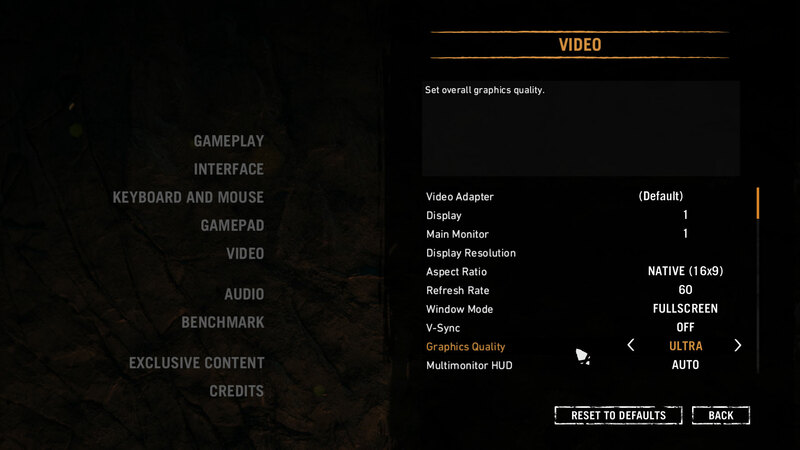 In short, it’s far from what we’ve expected to see in a Predator gaming machine. 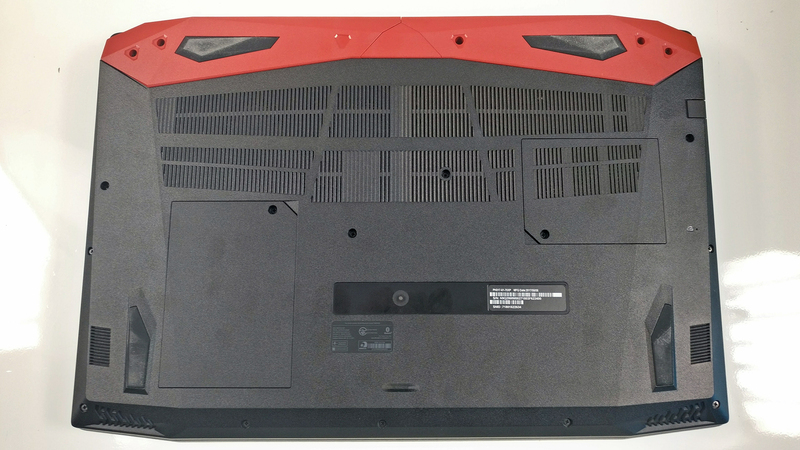 Also, our concerns about the cooling design, which is the same from the 15-inch variant, are finally confirmed. Find out more in the full review below. 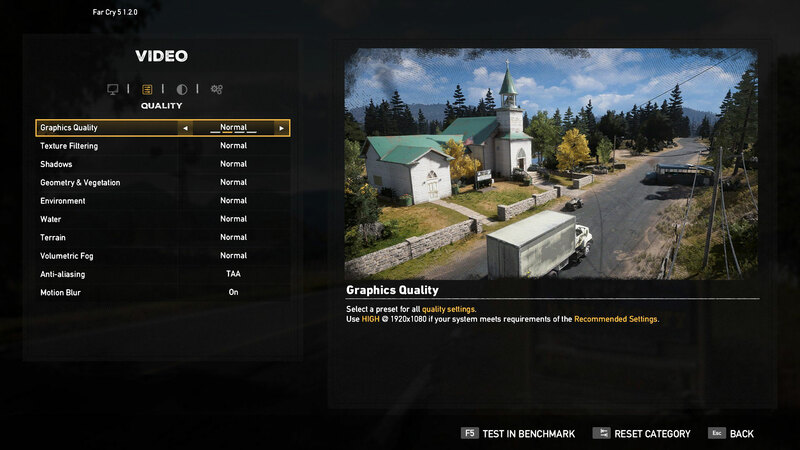 Update: Benchmarks of the Core i7-8750H configuration added. The package contains all the usual user manuals, AC power adapter, power cord and the laptop itself. As we already pointed out, the Helios 300 17-inch shares the same appearance as the 15-inch model. It has black paint all over it with the usual red accent around the interior and exterior. And probably due to the absence of metal, the whole notebook weighs 2.96 kg which is far less than most 17-inch gaming laptops out there. It’s also thinner than expected with the sides measuring at just 29 mm. Unfortunately, though, the overall portability and the absence of more rigid materials has resulted in subpar resistance to torsion and flexing. The lid, for example, is easy to bend in the middle and twisting the whole screen is visible. Both result in distortions the LCD screen and while we observed the same in the 15-inch version, the aluminum sheet there didn’t allow flexing to such high degree. In addition, the brushed aluminum-like plastic on the Helios 300 17-inch just doesn’t feel all that good. The hinge, on the other hand, feels sturdy and keeps the lid firmly in place even in unstable environment. Still, opening the laptop with one hand isn’t possible. As for the bottom piece, it uses the usual roughened plastic finish and delivers some grill openings for the extra air intake. As we go around the sides, we find that the port distribution is convenient and the I/O is decent but there’s no additional USB-A 3.0 connector – only one on the left paired with a USB-C 3.1 (Gen 1). The rest of the connectors are RJ-45 for LAN, SD card reader and an HDMI while on the right, you will find another set of USB 2.0 ports, 3.5 mm audio combo jack and the DC charging port. The interior is the big let down in this case – the whole surface around the keyboard and the touchpad is made of plastic that attracts fingerprints, it’s smooth to touch but fails to impress with sturdiness in few key spots. 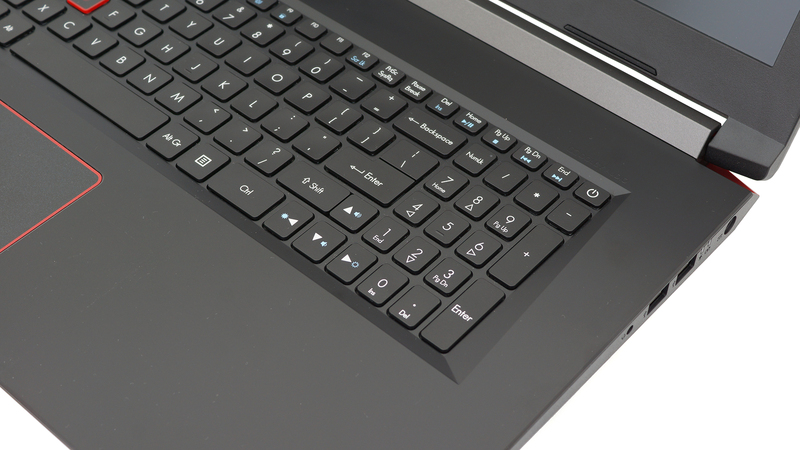 The center of the keyboard and the wrist rest area bend easily and more importantly, normal clicks on the touchpad result in slight sinking of the interior around the spacebar key. Again, we want to stress on the fact that we didn’t see any issues of the same sort in the 15-inch model. Anyway, as far as the touchpad and keyboard are concerned, they are just fine but nothing out of the ordinary. 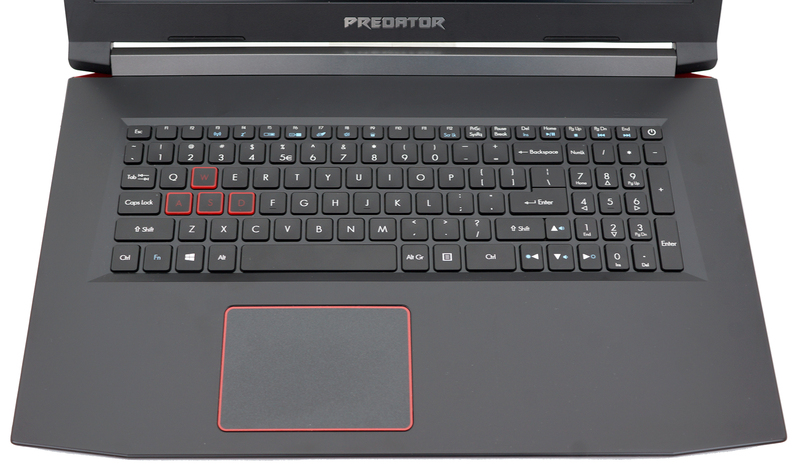 Just like the 15-inch alteration, the Helios 300 17-inch comes with the same touchpad and keyboard design found in the much cheaper Acer Aspire VX 15. That’s not necessarily bad but we really would have appreciated more responsive clickpad and deeper key travel. 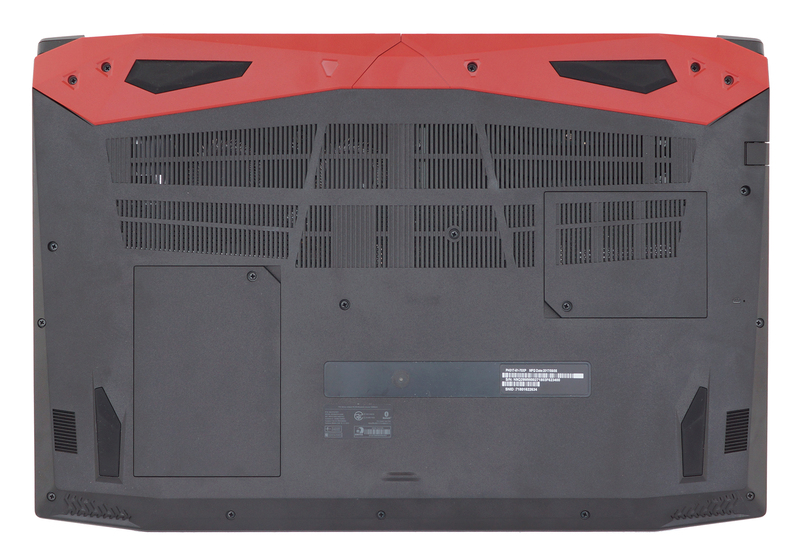 Although there are two maintenance hatches, they provide access only to the HDD and the RAM slots. For the rest of the hardware, you will have to take off the whole bottom piece. This, however, isn’t such time-consuming process – you just have to remove all the screws around the bottom and pry it up. 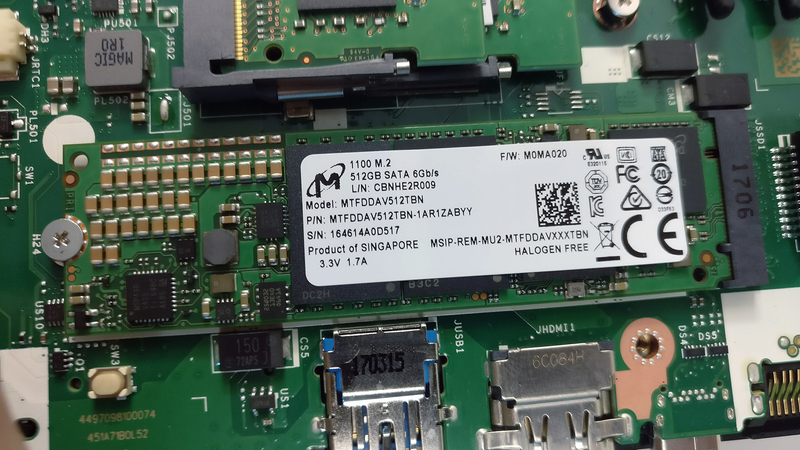 As to be expected, the laptop comes with a standard 2.5-inch bay for an HDD or SSD and an additional M.2 SSD slot that supports PCIe NVMe drives but in our case, the unit came with an M.2 SATA SSD from Micron with 512GB capacity and 2280 in size. 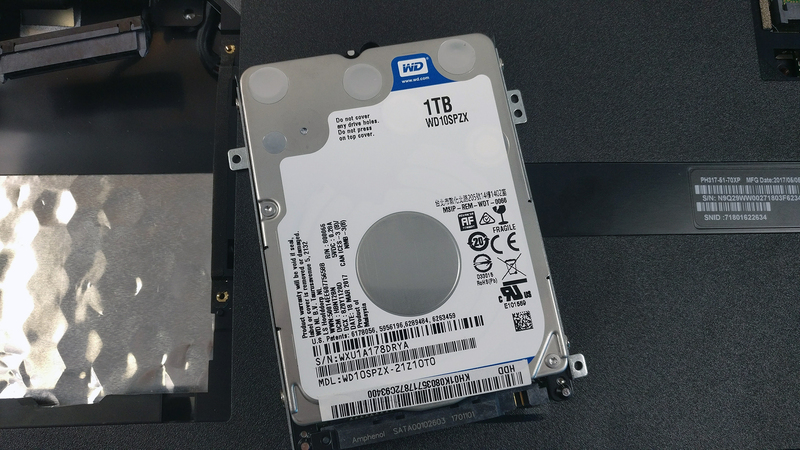 The 2.5-inch HDD can be found under one of the service hatches and it’s WD Blue with 1TB capacity, while the M.2 slot can be accessed after you’ve removed the bottom piece. The other maintenance hatch gives you easy access to the RAM slots. 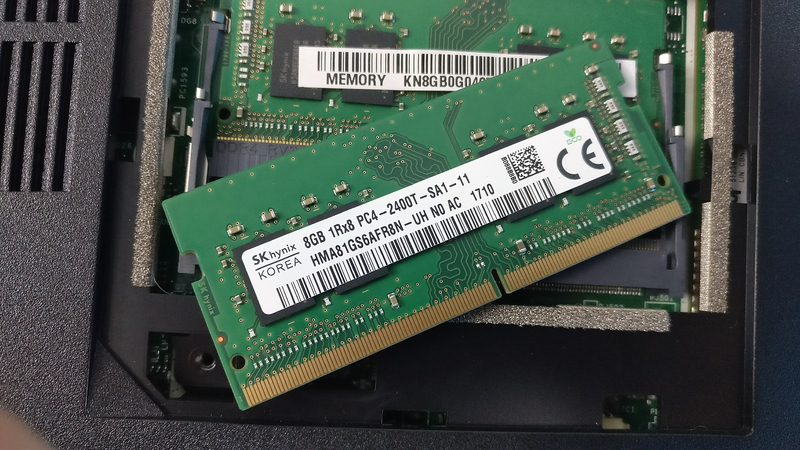 Our testing sample came with two 8GB DDR4-2400 RAM sticks but you can go as far as 32GB using two 16GB sticks. 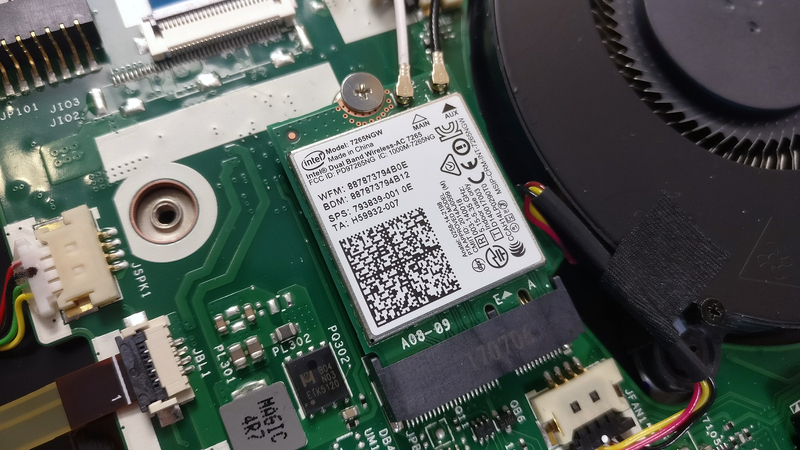 The Wi-Fi module is right next to one of the cooling fans and it’s the well-known Intel 7265NGW. 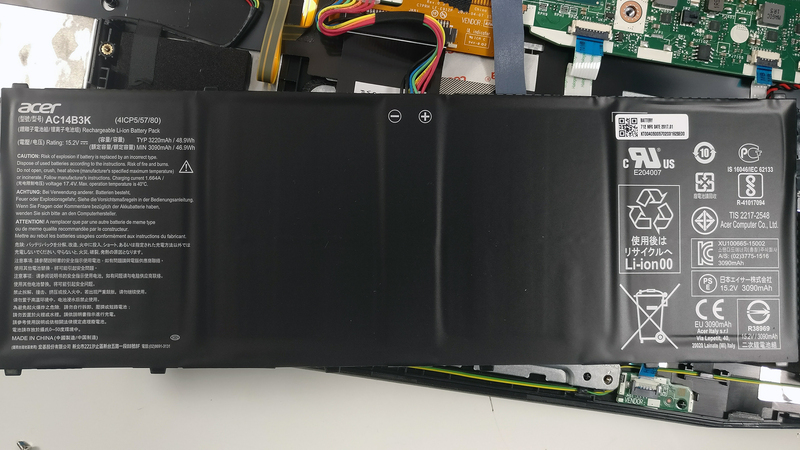 The laptop uses a relatively big 48.9Wh battery located under the wrist rest area. 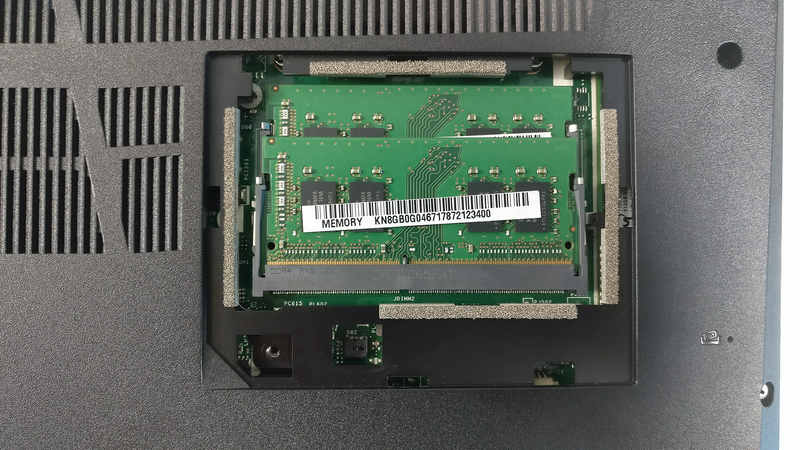 Unfortunately, the cooling system is identical to the 15-inch model with all three heat pipes connecting both heatsinks (CPU and GPU) and going directly to the cooling fans, which in turn are also stuck together. 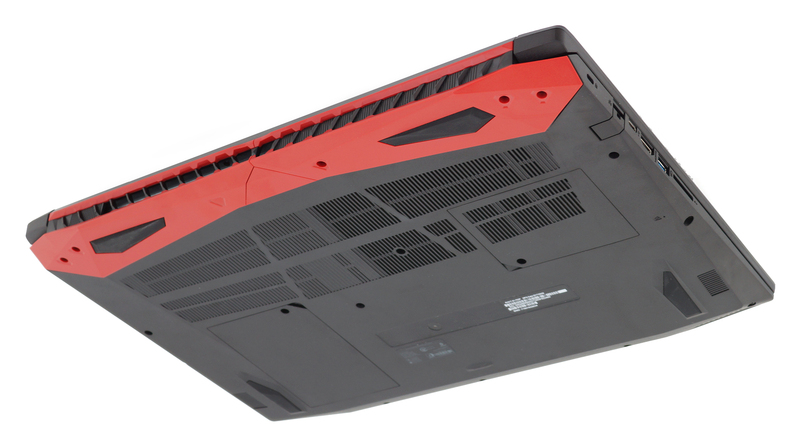 This cooling design has proven to be problematic for years now and it’s the first time Acer has used it. Quite disappointing. The 17-inch Helios 300 uses a Full HD (1920×1080) IPS panel manufactured by Innolux with model number N173HCE-E31. With a 17.3-inch diagonal, the screen has 127 ppi (pixel density) and 0.1995 x 0.1995 mm mm pixel pitch. It can be considered as “Retina” when viewed from a distance equal or greater than 69 cm. We were able to record a maximum brightness of 312 cd/m2 in the center of the screen and 293 cd/m2 as average across the surface with only 11% maximum deviation. The color temperature at maximum brightness on white screen is 7800K, which is considerably colder than the standard 6500K. As we go along the grayscale with different brightness levels, the color temperature appears to stay at around 7800K. Below you can see the results at 40% brightness (140 cd/m2). The maximum color deviation dE2000 at 140 cd/m2 (40% brightness) is 2.9, which is good since values above 4.0 are unwanted. 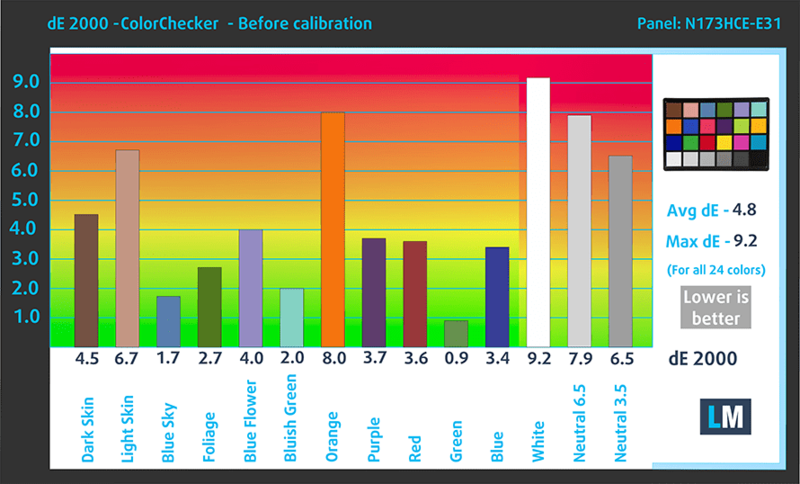 The contrast ratio is okay – 770:1 and falls down to 650:1 after calibration. 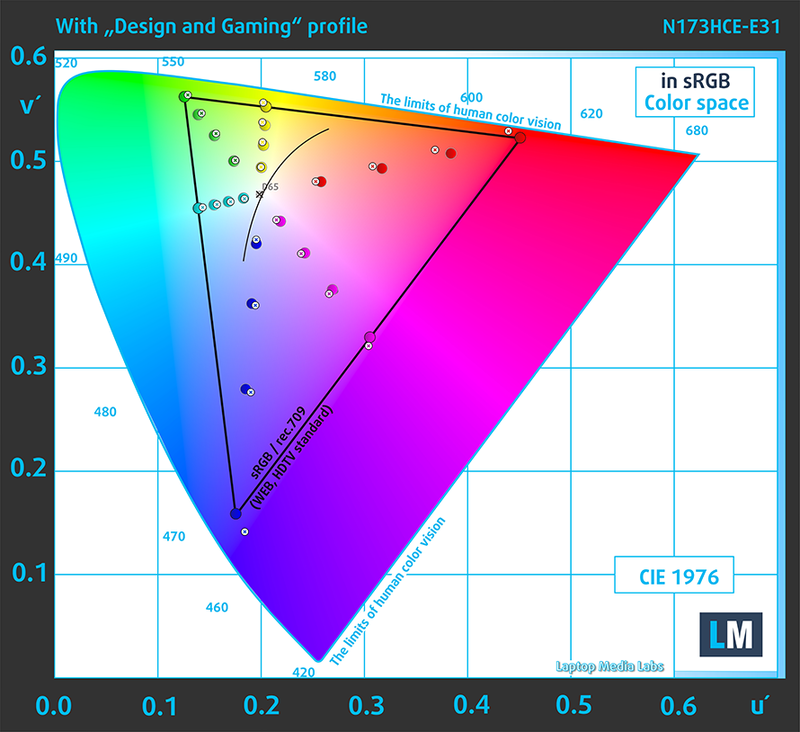 We are pleased to see that the sRGB coverage goes as high as 94% making the display good for gaming and multimedia purposes. Unfortunately, the display emits pulsating light (uses PWM) and can be considered pretty aggressive at 1 kHz. You won’t experience any negative effects on your eyesight only if you use the notebook’s display at maximum brightness (100%). On contrary to its 15-inch sibling, the 17-inch Helios 300 surprises with decent IPS panel that has numerous good properties and just a few shortcomings. For instance, the sRGB coverage is wide providing vivid colors and the maximum brightness is pretty high as well. The contrast ratio is a bit lower than expected for an IPS panel but not necessarily bad. The only thing that you will definitely have to consider here is the presence of aggressive PWM from 0 to 99% brightness. However, our custom Health-Guard profile can eliminate the PWM. 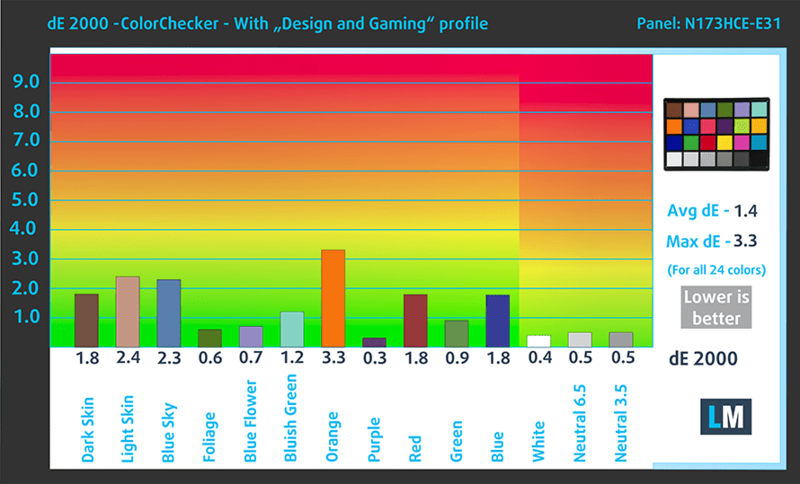 The rest of our profiles will make the color reproduction more accurate and fix the inconsistencies with the gamma curve and white balance. The laptop provides good listening experience with enough clarity in the low, mid and high frequencies. The battery capacity is almost identical to the 15-inch model and to be honest, the battery life on this thing is surprisingly good, especially for a 17-inch gaming laptop. The 48.9Wh unit provides enough juice to power up the Core i7-7700HQ CPU and the 17.3-inch Full HD IPS panel for quite some time. The main reason for the long battery life is the lack of G-Sync support, which in turn disables the support for NVIDIA Optimus (switchable graphics). All tests were run using the usual settings – Wi-Fi turned on, Windows battery saving feature turned on and screen brightness set to 120 cd/m2. Not a bad result on the web browsing test – 389 minutes (6 hours and 29 minutes). Slightly lower than the web browsing but still a good result – 326 minutes (5 hours and 26 minutes). Of course, the laptop isn’t made for gaming away from the plug but it kept on running for almost two hours – 105 minutes (1 hour and 45 minutes). 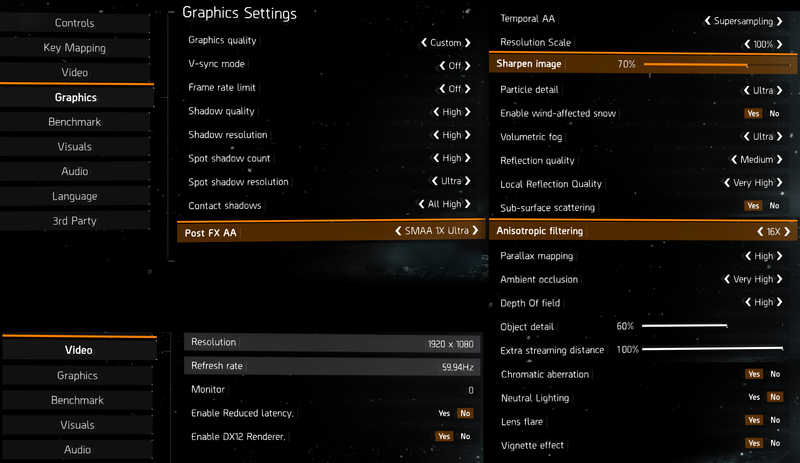 Here you can see an approximate comparison between the CPUs that can be found in the Acer Predator Helios 300 (17", PH317-51/52) models on the market. This way you can decide for yourself which Acer Predator Helios 300 (17", PH317-51/52) model is the best bang for your buck. Fritz is a chess benchmark that tests the computing capabilities of the CPU with various chess moves. The Intel Core i7-7700HQ scored 13.455 million moves per second. In comparison, one of the most powerful chess computers, Deep(er) Blue, was able to squeeze out 200 million moves per second. In 1997 Deep(er) Blue even beat the famous Garry Kasparov with 3.5 to 2.5. As usual, we ran the standard stress test, which does not represent real-life usage but it’s still the most reliable way to assess the overall stability and effectiveness of the cooling system. Judging by the temperatures and the chip’s Turbo Boost utilization during the CPU stress test, the cooling system seems to be fine at first. 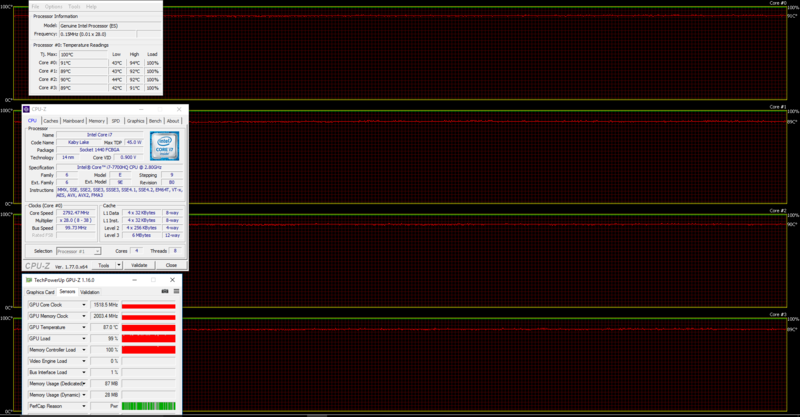 Less than 80 °C at 3.4 GHz after an hour of heavy workload is a pretty good result. 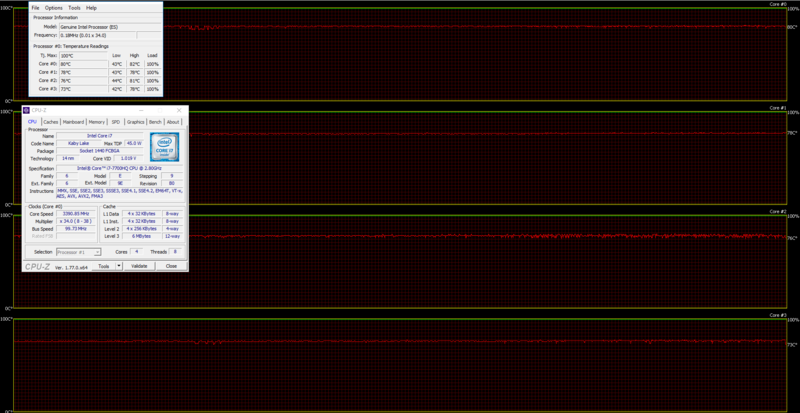 However, after we turned on the GPU stress test as well, things started to heat up fast. The CPU toned down to its base 2.8 GHz frequency and the GPU as well – at 1518 MHz. While the CPU was running slightly warm, the GPU reached a toasty 87 °C, which is pretty high for a GTX 1060. The higher inner temperatures translated into higher surface temperatures as well. 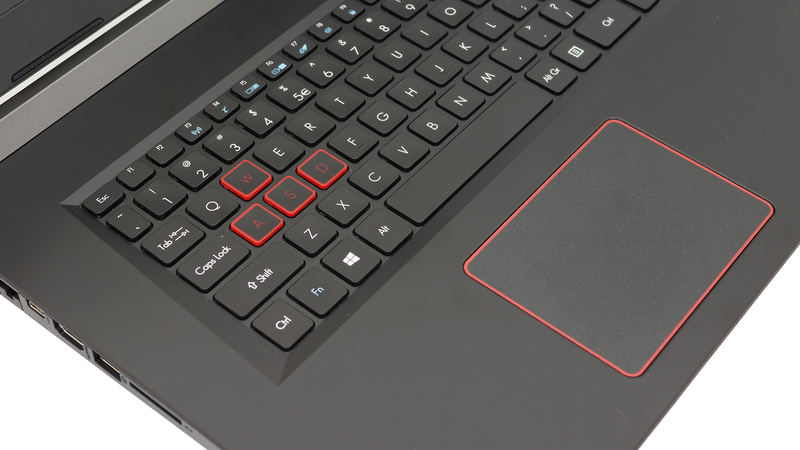 We measured more than 50 °C around the upper part and the center of the keyboard, which is even higher than the thinner and lighter Acer Aspire V 17 Nitro BE with the same CPU and GPU. 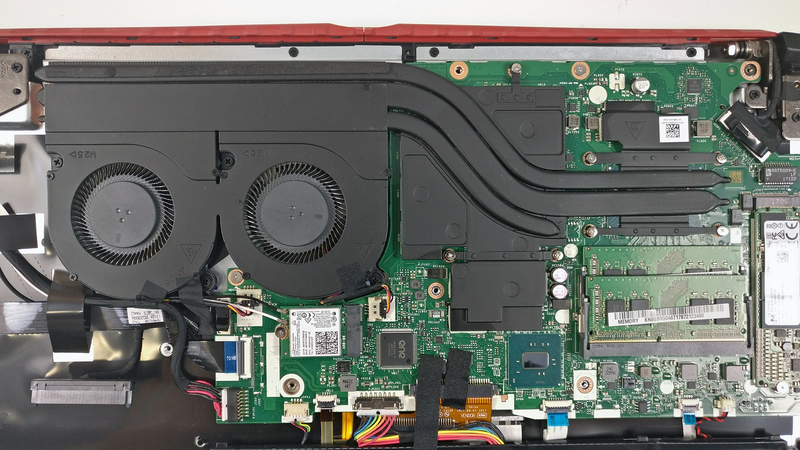 We are really puzzled by the fact that Acer came up with this inefficient cooling design, which is still causing some problems with the Lenovo Y-series three years in a row. First, the Lenovo Y50, then the Y700 and now the Legion Y520 share the same cooling solution that causes high inner and outer temperatures and sometimes pushing the hardware to throttle. Apparently, the Predator Helios 300 lineup also joins the club. 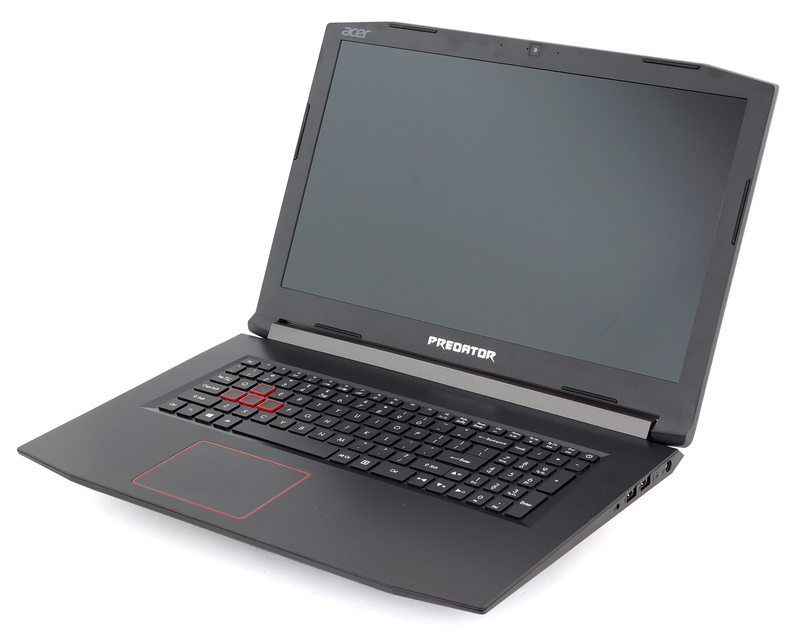 For instance, the laptop comes equipped with a good IPS panel with few drawbacks – PWM and lower than usual contrast ratio – and good properties for gaming and multimedia – high maximum brightness and wide sRGB coverage. The PWM issue, however, can be fixed with our Health-Guard profile so you can enjoy a pleasant gaming and multimedia experience without putting unnecessary strain on your eyes. Also, due to the plastic construction, Acer was able to shave off a few grams here and there making the 17-inch version of the Helios 300 one of the most portable 17-inch laptops we’ve had with impressive height as well. And last, but not least, the notebook offers way above average battery runtimes compared to its 17-inch gaming rivals. That’s definitely something we didn’t expect. Unfortunately, though, the use of plastic has resulted in the overall sturdiness of the machine. Leaving behind some of the aluminum elements from the 15-inch model, the 17-inch Helios 300 doesn’t impress with sturdiness at all. Still, one of the biggest problems here is the cooling solution. Just like its 15-inch sibling, the 17-inch alteration struggles to keep the hardware and interior cool under load due to the badly designed cooling system. We really hoped that the 17-inch model will do at least slightly better than the 15-inch one. Please update the review of the 15 inch model as you left some bits out as the model had some defects. We are still waiting for the final unit to arrive. Thanks to you too, Ahmed!